Weekenders (grey) and Chesapeake (blue) locked in action. 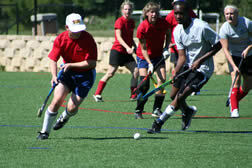 BFHA Fall League play is held on the two turf fields at the Roland Park Country School in Baltimore. Follow the directions below or visit the Roland Park Country School website for more information.